Harper Greer is the latest boutique to open in Lafayette's La Fiesta Square. I stopped by recently and met the shop's owners, Terry and John Kiskaddon. The couple has been in the fashion business for over 40 years with stores first in San Francisco and then downtown Oakland. Terry studied fashion design and initially she did all the designing and had the clothing made onsite at their SOMA location. Over time Terry added other quality lines, many of them local, to their retail store. Harper Greer specialized in clothing for plus-size women but after much demand they now offer unique fashions starting at size 4 to 24 for woman of all ages. The store occupies half of the former Specialtees space, and in addition to mannequins, display cases, and racks of clothes there is an unexpected accessory - a shinny black piano. Turns out that when John isn't utilizing his excellent customer service skills, he's tickling the ivories. Something else to catch the eye, hanging above the piano is an Art Nouveau style mural. Depicting John and Terry, among other well-dressed folk, the mural was painted by a friend and came with the couple from the Oakland store. When chatting about trends for spring 2019, the couple said colors of the season are coral and off shades of blue and we will see lots of texture, including mixed textures like a plain knit with a rib. John says that when it comes to fashion, "People are getting bolder." Terry pointed out that the jumpsuit is big for spring and one thing that cannot be kept in stock is a Kimono-inspired jacket by Moonlight. Harper Greer is a nice addition to Lafayette and well worth a visit for some new spring fashions. Kimono means "a thing to wear" in Japanese. The traditional Japanese Kimono silhouette has been influencing fashion since the 19th century. On now at the San Francisco Asian Art Museum is the exhibit "Kimono Refashioned," an exploration of how the Kimono was and is used by fashion designers in western design. From fabrics to colors, images to shapes, past designers like Chanel and Madeleine Vionnet as well as modern designers Tom Ford and Issey Miyake, have incorporated Japanese aesthetics into their designs. The exhibit includes two galleries featuring over 35 garments from the Kyoto Costume Institute, dating from 1870 to today. 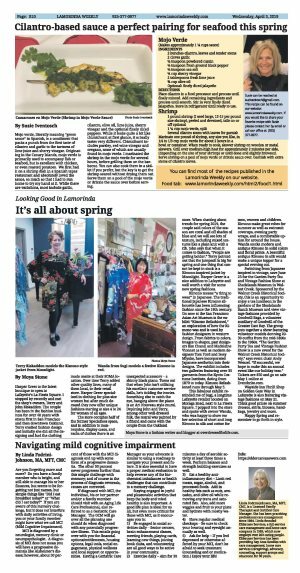 Kimono Refashioned runs through May 5. This fabulous exhibit reminded me of Sugi, a longtime Lafayette retailer located on Moraga Road, next to La Fiesta Square. 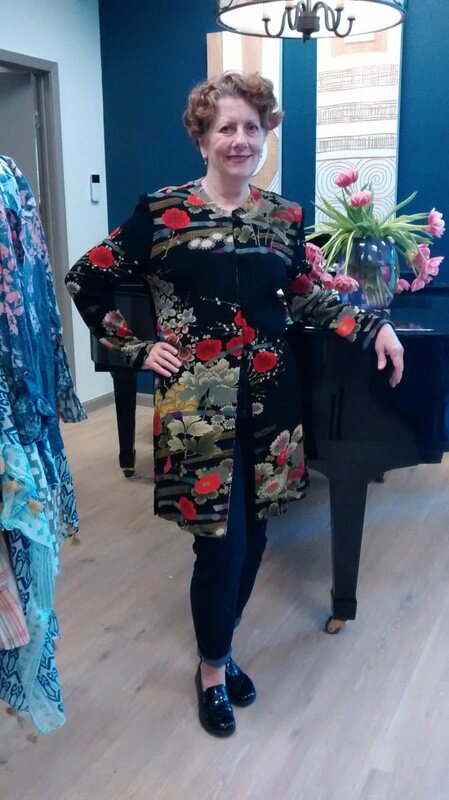 I popped into the store and spoke with owner Wanda, who was happy to show me her selection of short and long Kimono in silk and cotton for men, women and children. Kimono make great robes for summer as well as swimsuit coverups, evening party wraps, and a comfortable option for around the house. Wanda stocks modern and antique Kimono in solid colors and floral prints. A beautiful antique Kimono in silk would make a unique topper for a special evening out. 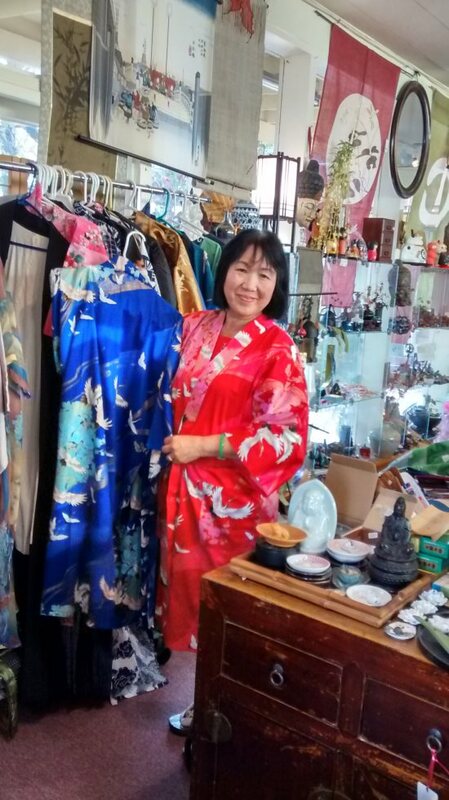 Switching from Japanese inspired to vintage, save June 23 for the Garden Party Tea and Vintage Fashion Show at Shadelands Museum in Walnut Creek. Sponsored by the Walnut Creek Historical Society, this is an opportunity to enjoy a tea luncheon in the gardens of the Shadelands Ranch Museum and view vintage fashions provided by Goodwill Bags, a volunteer auxiliary of Goodwill of the Greater East Bay. The group puts together a show featuring volunteer models donning 20-30 outfits from the mid-1800s to the 1960s. "The Garden Party Tea and Vintage Fashion Show is a new event for the Walnut Creek Historical Society," says event chair Andy Wenzel. "If successful, we hope to make this an annual event like our holiday teas." Tickets are $50 and go on sale May 1 online at Eventbrite.com. Wayside Inn Thrift Shop on Golden Gate Way in Lafayette is also featuring vintage fashions on May 21. Think good prices on summer dresses, skirts, blouses, handbags, jewelry and more. Happy Spring and remember to go forth in style. Moya Stone is a fashion writer and blogger at www.overdressedforlife.com.